We've got some more gigs coming up before Christmas! This Saturday 22nd Sept we'll be joining Red, Primitive Instinct, Casual Affair, Liaison and Jump at the Iron Horse in Sidcup for a full day of prog-rock. Starting at 2pm, we'll be on at 6.50-8.10 with advance tickets available now from here. We'll then be playing 30min acoustic support sewts to Jump at the Limelight Theatre in Aylesbury on Saturday 13th October and the Wycombe Arts Centre in High Wycombe on Saturday 24th November. And to finish the year off in style we'll be playing our Christmas Show at the Greystones, Sheffield on Thursday 20th December, tickets now on sale here. But what about the 40th anniversary CDs & DVD you ask? Well, they are well on their way, it's just taken a lot longer than I expected! The DVD is finished & ready to send off to the pressing plant, the CDs are very nearly there, we're just putting some finishing touches to the mixes, and they'll be off to the pressing plant too. We're still taking orders at the bonus advance price of £20 for the double CD, DVD and a bonus DVD of our 1985 Birmingham University show. Check out my flickr site for all the oldest and newest Haze photos, including photos from 1978, 1988, 1998, 2008 & 2018! I'm now taking advance orders for the 40th anniversary double live CD & DVD. We are multitrack recording both the Sheffield and Southampton shows, professionally videoing the Sheffield show, and videoing Southampton ourselves. So the DVD will probably be of the Sheffield show, and the double CD a 'best of' both shows, but I won't know for sure, 'til we've played them! We also have an exclusive live DVD of our Birmingham University 1985 gig including previously unseen footage from our appearance at the UK Electronica festival at Sheffield University in 1984 and our studio video of 'Ophelia' from 1986. We've only produced 100 copies & it will be available free with all orders of the 40th anniversary CD/DVD at a discounted advance price of £20 for all three! I'm hoping to have the 40th anniversary CDs & DVD ready for the Rotherham gig on Saturday 4th August, if you're coming to the Sheffield or Southampton gigs you can order it then & pick up the bonus DVD at the gig. Check out all our merchandise here. Tickets now on sale for the Greystones here and Talking Heads here. We are please to announce that the support for both shows will be Single Bass (aka Jennifer Moore) veteran of our Dutch Tour '87 and Xmas tours! I know it seems like only yesterday, but in June 2018 we will be celebrating 40 years of Haze music! On Saturday 23rd June we're playing at the Greystones in Sheffield and on Sunday 24th June Talking Heads in Southampton. Tickets will be on sale soon & we're hoping to announce some names from our past as special guests. There will of course be a double live CD, and I'm hoping to be able to release a DVD of the shows too. Please let me know if anyone can help with the DVD or if there's anywhere else would like to book us? (Another trip to Europe, while we're still allowed, would be nice!) Message Chris. Is it that time already? Haze Christmas Show this year is back at the Walkley Community Centre on Friday 15th December, tickets are £6, £8 on the door, available here. And while I'm here, keep 23rd June next year free as Haze will be 40! Not long to go now! We're on stage 2 at HRH prog on Saturday 18th March 3.10-4.10pm, then we've got our first South coast show in a LONG time at Talking Heads with A Formal Horse on Wednesday 12th April. Tickets are just £6.60 (inc booking fee) from here. Haze Christmas Show 2016 at the Shakespeare, Sheffield on Saturday 17th December, tickets on sale NOW! Haze at The Greystones, Sheffield Sunday 26th June 2016, tickets £8 on sale now here! We're also playing at the Cambridge Rock Festival on the Classic Rock Society Stage on Friday 5th August, tickets from £25 here, for an absolutely classic line-up. And we've just been confirmed for next year's HRH Prog fest! It's an absolutely epic line-up in North Wales 16-19th March, a bit pricey, but with bands like Hawkwind, Wishbone Ash, Barclay James Harvest, Pendragon, IQ, The Enid, Gong, Curved Air, The Strawbs, The Pretty Things, Jump, Credo and of course Haze, what do you expect! Can't wait already!! Haze Christmas Show! Sunday 20th December at the Shakespeare, Sheffield S3 8UB with special guests Rog Patterson & Follow The Moon. Tickets £6 here. Friday 10th at The Citadel, St Helens with Strangefish - tickets from CRS. Saturday 11th at The Cutlers Arms, Rotherham admission free. Haze Christmas Party Sun 21st Dec at The Shakespeare, Sheffield £5 on the door, advance tickets £4 here . Haze Italian tour report & photos now online. 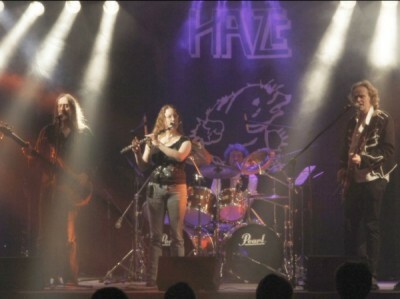 Haze headline DanFest4 at the Musician, Leicester, Sat 15th November, tickets on sale now here. 'The Cellar Tapes' CD reissue is now available to order from our Merchandise page, or you can download it from Bandcamp. Write to us via email!